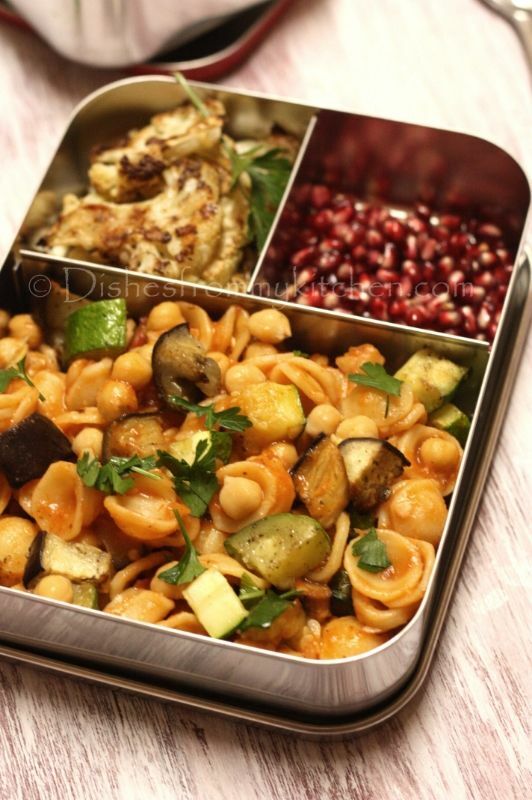 Dishesfrommykitchen: KIDS LUNCH BOX - CHICKPEAS AND ROASTED VEGETABLE ORECCHIETTE, PARMESAN CRUSTED CAULIFLOWER ! 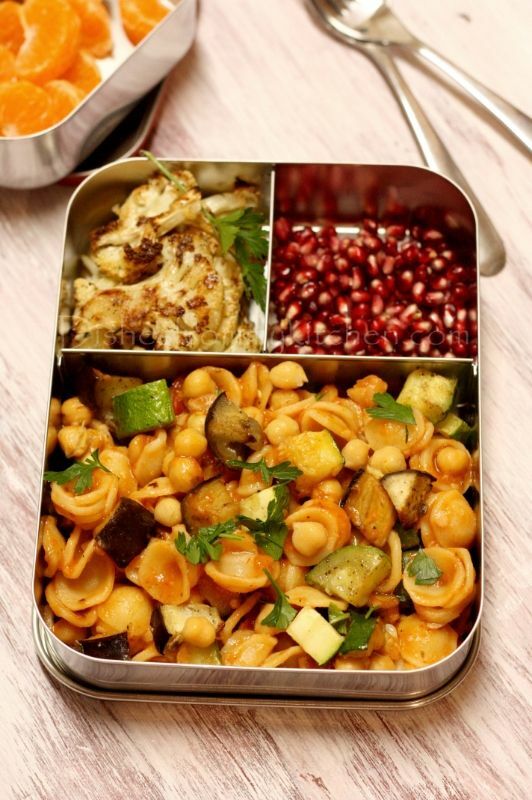 KIDS LUNCH BOX - CHICKPEAS AND ROASTED VEGETABLE ORECCHIETTE, PARMESAN CRUSTED CAULIFLOWER ! Marinara sauce - 1 to 1/4 cup store bought or homemade, I used Homemade) Increase or decrease the sauce the way you like. 1. 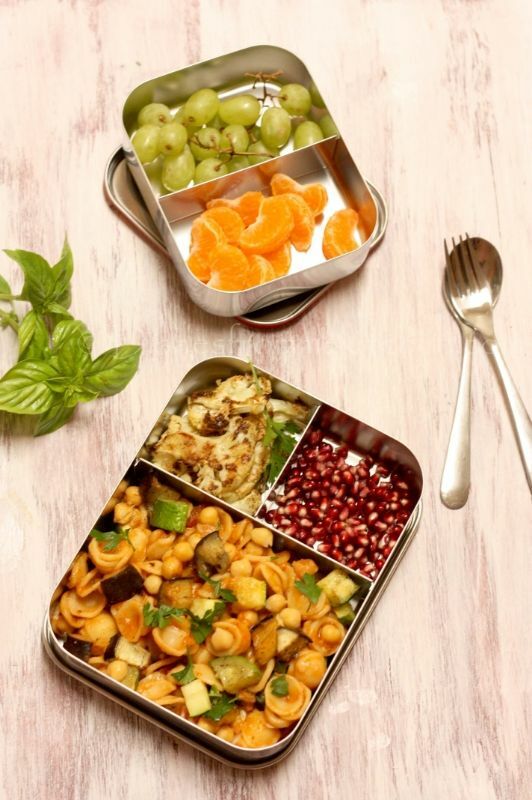 Cut the vegetable to big chunks, drizzle little olive oil, salt and pepper toss and spread them in baking pan lined with foil. 2. 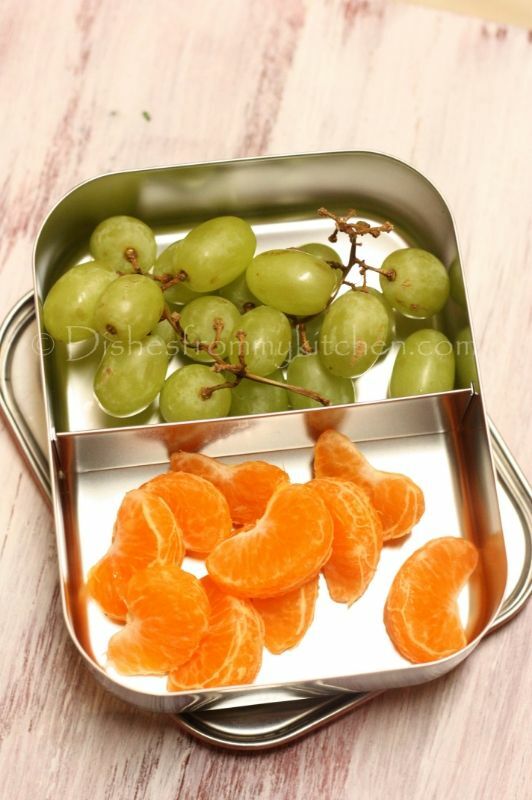 Roast them in 425 f preheated oven until they are slightly browned. Stir every 5 to 10 minutes. This approximately takes 15 to 20 minutes. Once done take it and keep it aside. 3. When this is happening boil water for pasta with little salt. 4. Now heat olive oil in a pan, add finely chopped garlic and red chilli flakes. 5. Add the sauce and 1/4 cup water and add boiled chick peas as well. Let this cook in the sauce for couple of minutes. 6. To this add cooked pasta (al dente), roasted veggies, finely chopped basil and parsley (reserving few for garnish). Give it a toss until everything is mixed well. 7. Switch of the flame and immediately add the grated cheese. 8. Garnish with remaining herbs. 1. 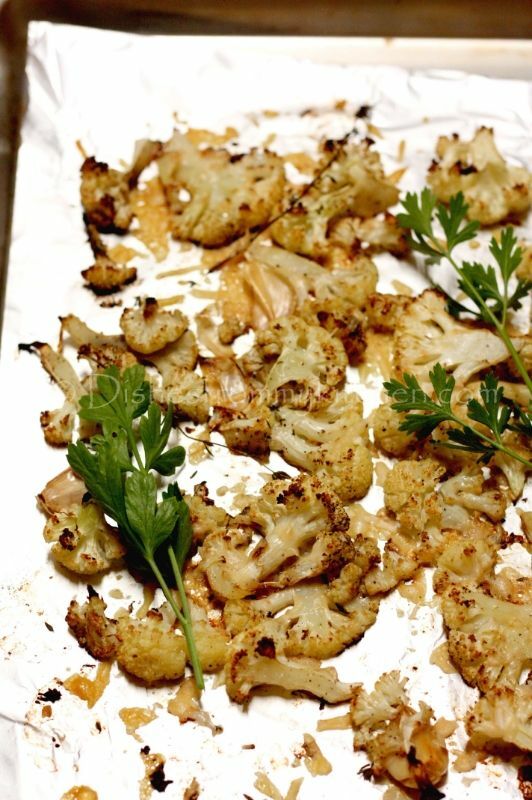 Slice the cauliflower into small florets. Wash , drain and dry in the paper towel. 2. In a bowl add the cauliflower and all the above ingredients except the cheese. 4. Roast them till you see brown spots here and there. Tossing them occasionally. 5. Now Sprinkle cheese on the top and put back in the oven till the cheese turns light brown in color. Serve as a side with Pasta, as an appetizer or with the dip. Can you please post the recipe for the homemade sauce as well?